With over 300 pages of step-by-step guidance, these two individual books have 700+ five star reviews on Amazon and have helped thousands of authors write better books. Can Outlining Help You Write a Better Story? These bestselling guides will help you choose the right type of outline to unleash your creativity, guide you in brainstorming plot ideas, and aid you in discovering your characters. Award-winning author K.M. 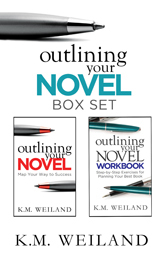 Weiland’s acclaimed Outlining Your Novel shows you how to embrace outlines in a way that makes the writing process fun, inspiring, and easy. Writers often look upon outlines with fear and trembling. But when properly understood and correctly wielded, the outline is one of the most powerful weapons in a writer’s arsenal. Outlining Your Novel: Map Your Way to Success will help you choose the right type of outline for you, guide you in brainstorming plot ideas, aid you in discovering your characters, show you how to structure your scenes, explain how to format your finished outline, instruct you in how to use your outline when writing the first draft, reveal the benefits of outlining, and dispel the misconceptions. Now it’s time to put those lessons to use! The Outlining Your Novel Workbook presents a guided approach to getting the bones of your story down on paper, identifying plot holes, and brainstorming exciting new possibilities. Let outlines help you write a better story! "I never liked outlining but [Weiland] actually has great ideas and tips that even got my pantser brain to start outlining a bit more."